I figure, after the first full work week of 2015, you might deserve an easier ride this weekend. So take a load off smack dab in the middle of your comfort zone, and let’s have dinner tonight at Shuler’s Steak and Seafood. This stalwart of the North Side of Watertown has a couple new owners and a refreshed interior to match, plus a cozy, somewhat secluded bar area complete with a spanking new flat screen TV for your athletic viewing pleasure. The old school dining room is receiving its makeover gradually but steadily, with new window treatments and lanterns brightening up the space when we visited, but fresh tablecloths and water pitchers yet to come. The liquor license was also in-process then, but it’s since been acquired, so have no fear. The bar is now functional and that glass of wine you’ve earned this week is ready for you. Also ready is the bustling staff, catering to tables of families and older couples on the night we dined there, though at these prices and with the updated feel, I can see this becoming an affordable date night spot for young couples as well. You can still grab dinner here for $10, folks. $10!! 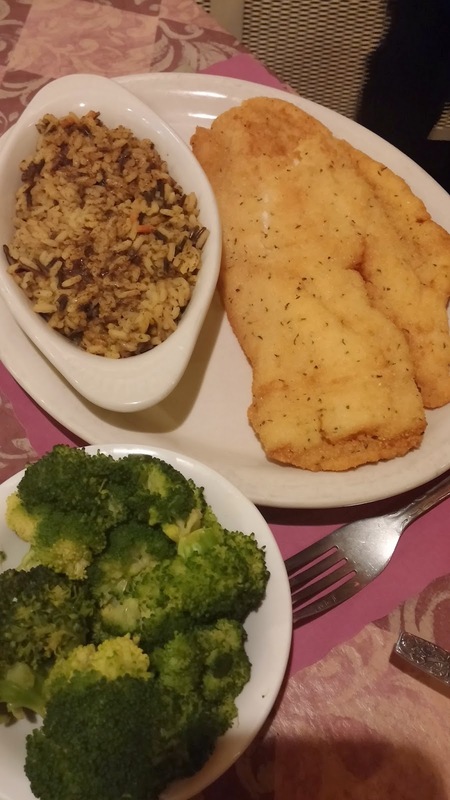 Shuler’s has a reputation as kind of a grandma’s restaurant, and part of that is well earned. You won’t find any words like fusion, molecular gastronomy, artisanal or vegan on the menu here. Nay, Shuler’s is where you come for really great renditions of the kind of food you ate growing up. In fact, when new owners Jason Tanner and Terry Williams took over, just about the only thing they didn’t change was their head cook. As a result, diners get practiced, homemade comfort food with no gimmicks. 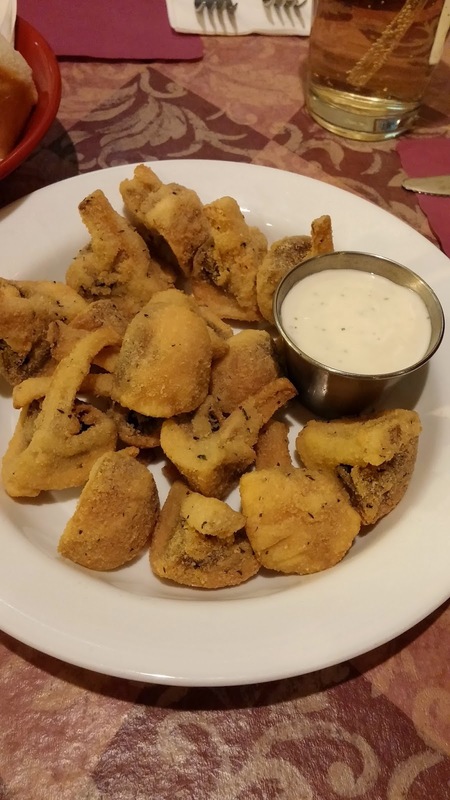 You might, say, start your feast with some fried mushrooms ($5.99). Simple bar food, right? Probably a frozen product, straight from the bag into the fryer? Not at Shuler’s! We received a dinner plate jammed with big, juicy white mushrooms, quartered, breaded with finely ground breadcrumbs, and flash fried. The mushrooms were cooked through but not dried out, and there wasn’t a hint of greasiness to the finished product. Dunked into ranch dressing, these flooded our mouths with the lightly earthy flavor of mushrooms and the tang of buttermilk and dill. Not quite so simple after all. I could have snacked on three platefuls. When we frequented Shuler’s in my tween days, the clam chowder ($3.99 for a cup) was one of my favorites, so I had to give it another try. This cup of creamy warmth was so packed with clams and potatoes, there was barely room for the chowder portion of the deal. 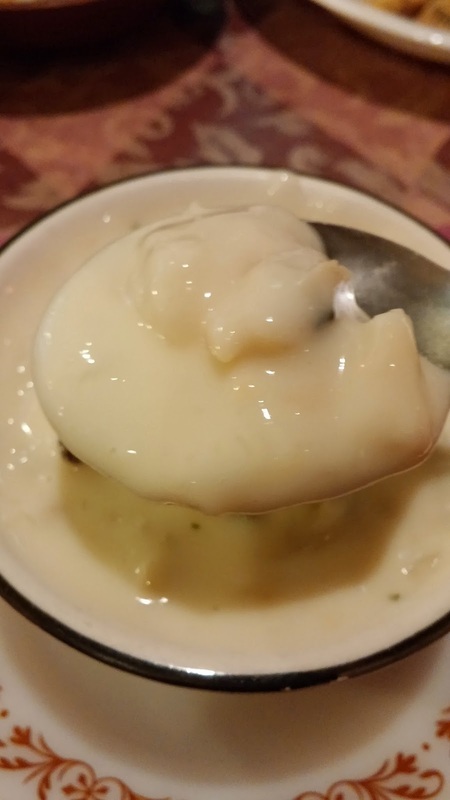 The predominate taste was of cream, rather than seafood, which is entirely up to preference. I quite liked it, though it didn’t blow me away or anything. The salads were a standard affair, with a couple grape tomatoes, de rigueur cucumber slices, red onion rings and romaine, but our upgrade to crumbly gorgonzola cheese on top added sharpness and personality. 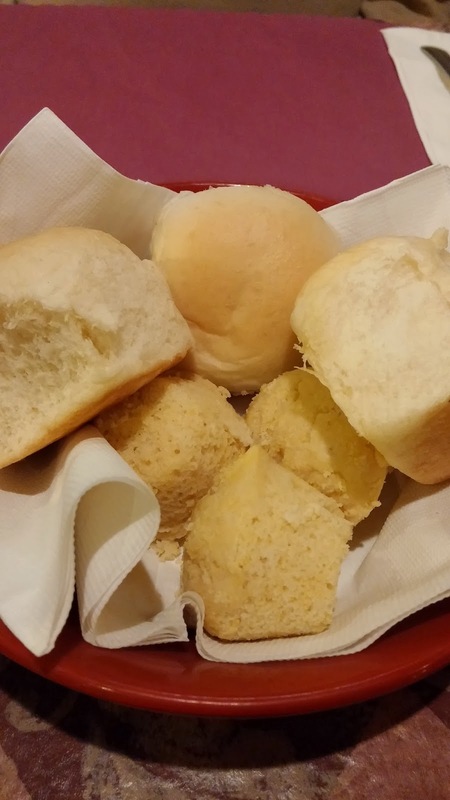 The generous basket of dinner rolls and corn muffins was also a throwback, but what a nice one. How few non-Italian restaurants are supplying a bread basket these days! Fried haddock ($11.99) was flaky + succulent, which equals perfectly cooked in fried fish math. The breading was very light and savory, with a bit of corn meal in the mix to add to the complexity and make it super crunchy. 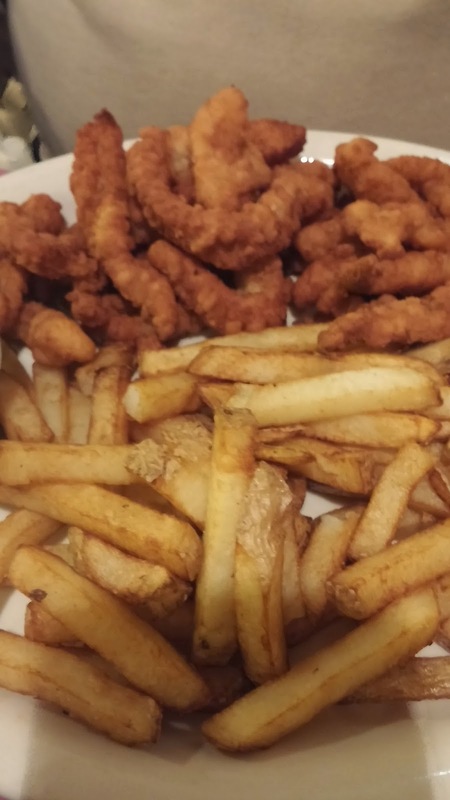 The French fries, typically a forgettable side, are in this case hand cut and double-fried as the kitchen gods intended; lightly seasoned and expertly fried. Again in this dish, Shuler’s is taking the ordinary and elevating it ever so slightly to make it really tasty and worth leaving the house to taste. Fried clams ($11.99) were a frozen product, so demerits; however, they also were plump, flavorful and not a bit greasy, so they kind of won me over – at this price point. While I’m an advocate of all-homemade food, there are a few cases in which a landlocked restaurant like Shuler’s, in the interest of keeping prices down, may choose a high quality packaged product rather than try to find fresh seafood and bread it themselves; this may be an instance in which this was a wise choice. Honestly, I’ve had hand breaded clams in New England that were weaker in flavor and texture than this plate, which was nearly overflowing with seafood. 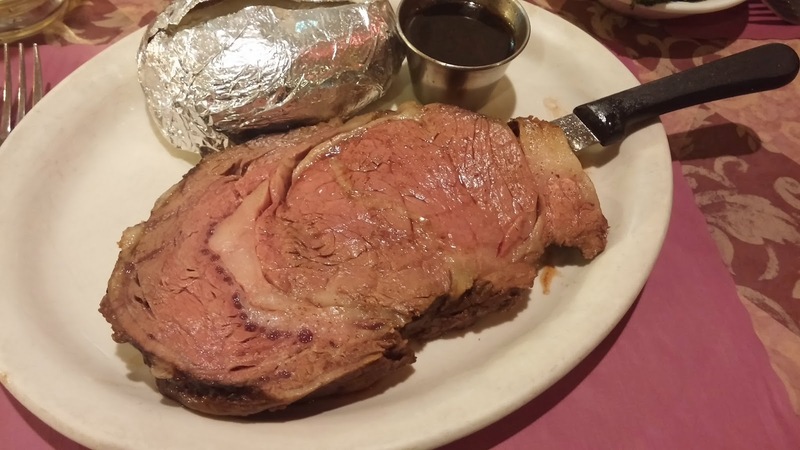 Prime rib is available every day at Shuler’s, which right away distinguishes it from most north country establishments. You don’t have to wait for Saturday for your slab of beefy goodness! My 12 oz portion was $16.99, cooked perfectly to my medium-rare specification, and plenty juicy. It was lacking a bit of seasoning for me, but I am a noted salt hound. A more aggressive hand with the salt and pepper would have suited me just fine, but otherwise, this was textbook perfect roasted beef. I haven’t had a baked potato since dinosaurs roamed the earth (approximately). Who is still serving them anymore? Shuler’s is, and this one was a sight for sore eyes. Hello, gorgeous carbs! I loaded that foil-wrapped, steaming pod of lusciousness up with a metric ton of butter and real, full-fat sour cream and regressed into the moaning, drooling form of my 11 year old self. This is how you kick it old school, people. I haven’t bought full-fat sour cream for my own home in eons. Desserts ran the gamut from a pretty run-of-the-mill coconut cream pie that didn’t set my hair on fire, with its boring vanilla pudding and packaged, sweetened shredded coconut, to a quite yummy lemon lush in which the tartness of the citrus was tempered with a sweet cream cheese layer on the bottom. The chocolate pie was a standout, with truly rich, deep, chocolately flavor. Dinner for three with no adult beverages, but one appetizer and three desserts, was $69.84, and the portions were pretty huge, you guys. It’s a new year, so I know everyone’s starting their diets and trying to figure out how to load up on vegetables and limit their breaded, fried proteins, so you might think a comfort food review is ill-timed. But I don’t know anyone who doesn’t like a home style, affordable, filling and comforting meal out now and again. And we all need cheat days, am I right? The service here is casual but excellent – your dirty dishes will be removed lickity split and your water glass will never go empty. There’s natural light from large windows with which to gaze upon your generous platter of chicken and biscuits or stuffed shrimp, and for the most part, this classic eatery is doing it right – homemade and legit. I award Shuler’s Steak and Seafood with a seven on the Big Hungry Shelby scale because the whole is equal to more than the sum of its parts. Family style restaurants providing hearty fare and good value are just as important to the gastronomic landscape as more refined spots which push culinary boundaries, and they’re just as good, albeit in a different way. Gravy has value, is what I’m trying to say, and good gravy is just what the doctor ordered on more occasions than a gastronome might imagine. 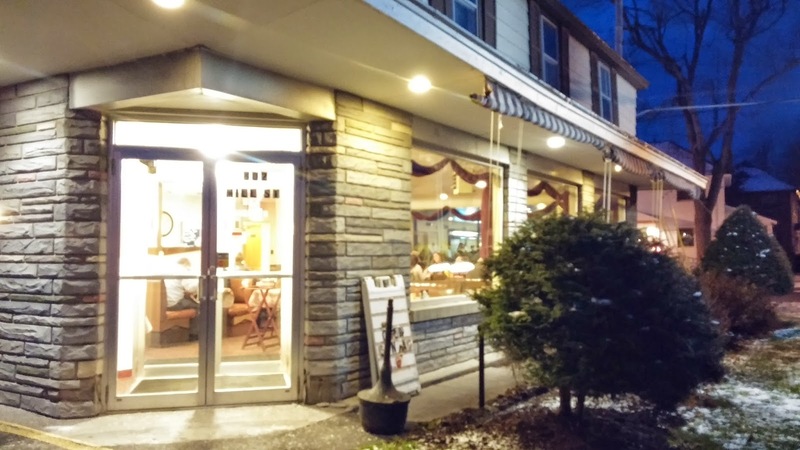 Shuler’s delivers tasty plates of solid food at more than fair prices to your table in a comfortable, light-filled dining room by a cadre of smiling servers, and sometimes, that’s just the ticket. On those nights when what you really want is relaxation and to pig out (I can think of a lot of nights when that’s just the ticket), Shuler’s is your new destination.